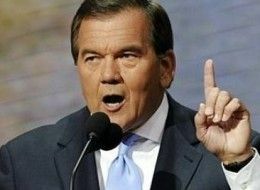 In a new book, former Secretary of Homeland Security Tom Ridge reveals new details on politicization under President Bush, reports US News & World Report’s Paul Bedard. Among other things, Ridge admits that he was pressured to raise the terror alert to help Bush win re-election in 2004. Ridge was never invited to sit in on National Security Council meetings; was “blindsided” by the FBI in morning Oval Office meetings because the agency withheld critical information from him; found his urgings to block Michael Brown from being named head of the emergency agency blamed for the Hurricane Katrina disaster ignored; and was pushed to raise the security alert on the eve of President Bush’s re-election, something he saw as politically motivated and worth resigning over. The Bush administration was forced to admit in the days after the 2004 alert that it was based on intelligence three or four years old. Officials then claimed there was a previously unmentioned “separate stream of intelligence” that justified the warning — but offered little tangible information to support their new story..
Ridge’s book, “The Test of Our Times: America Under Siege…and How We Can Be Safe Again,” comes out September 1.